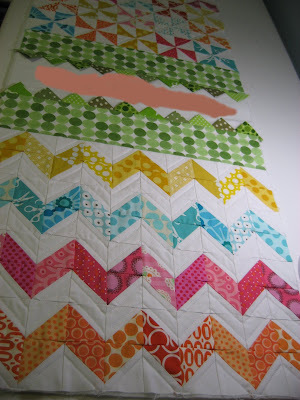 Hooked on Needles: Modern She Made Swap Gift ~ almost finished! Making this swap gift for my secret partner in the Modern She Made swap has been such a fun process, and it's almost finished! Here are my latest pictures, with a little blurring in just the right places to conceal the identity of my secret partner! The two pieces shown previously are now joined by the two strips of green dots and the two strips of green prairie points and the white strip where her name is hand embroidered. I used DMC perle cotton in two shades of green and copied her blog name using the same font she uses, just to make it extra personal! Of course you can't see that here, but once she receives it, I'll show you the completed project and the embroidery! The quilting on the pieced sections is simple straight line quilting done on my little old Singer domestic machine. 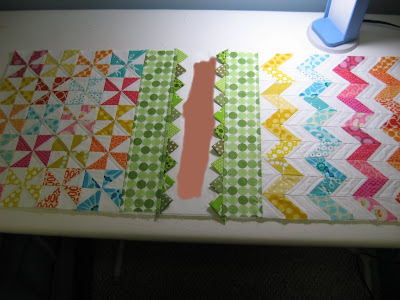 Since these pictures were taken, I have made the ties out of the same green dot fabric which will go on either side of this sewing machine cover to tie it closed, and the binding also made with the green dot fabric. Once I finish this little gift, I plan to make one or two other small items to send along with it. I'll take pictures of the whole package before I mail it so you can see it all after she does! Oh my, good secrets are so hard to keep! 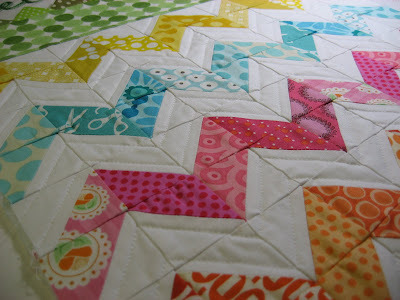 So lovely - love the zig zag's! Beautiful colors! and lucky swap partner! now why did i not ask for a sewing machine cover? !!! wow! This is gorgeous. And what a nice touch to personalize it. Wishing this were for me! What a lucky partner! Happy. I can't decide if the chevron or the pinwheels are my favorite. You are so talented.